Register interest for your @Raspberry_Pi. 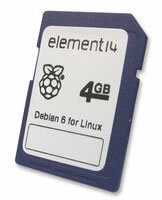 * Please note the Raspberry Pi does not come with the SD card included. Get all the essential accessories for your Raspberry Pi. Copyright © 2012 Premier Farnell plc Limited ALL RIGHTS RESERVED Copyright in the whole and every part of this website belongs to Premier Farnell plc Limited ("the Owner") and may not be used, sold, licensed, transferred, copied or reproduced in whole or in part in any manner or form or in or on any media to any person other than in accordance with the terms of the Owner's agreement, without the prior written consent of the Owner.